The Rayden Bi-Color 5-Point LED Light Kit with 5x RB10 from ikan is a complete lighting setup for the photographer in the studio or on the road. The kit includes five Lyra Bi-Color RB10s, each with a yoke mount, wireless remote control, Gold mount battery plate, and V-mount battery plate. For storage and transport, two cases are included for the stands and two cases are included for the lights. 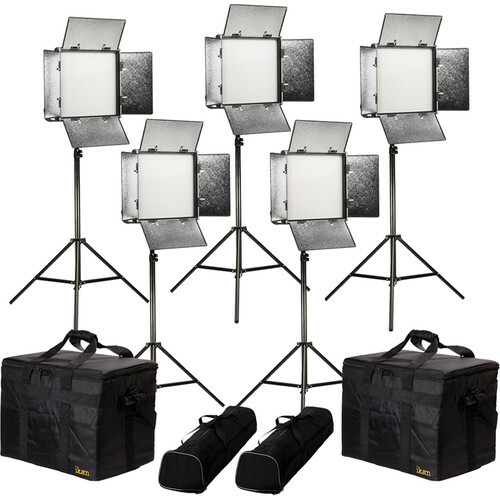 The Rayden RB10 Bi-Color 1 x 1 Studio & Field LED Light from ikan is built into a heavy-duty molded plastic chassis providing a lightweight yet strong variable color fixture with enhanced features such as 100-10% flicker-free dimming, LCD display, and an included wireless remote. It produces a 50° beam spread and the barndoors feature integrated gel clips. The fixture is DC powered, incorporating a 4-pin XLR connector and including an AC/DC power supply for mains power. Interchangeable Gold Mount/V-Mount plates are included so no worrying about getting the fixture that matches your battery system. The four-leaf barndoors provide control over light spill, and feature removable light intensifiers to suit your taste. The yoke is angled forward 30°, which allows you to open the barndoors all the way without hitting the yoke when the light is pointed straight forward. The fixture also has a combo baby pin/junior stud mount so you can mount it on a stand or hang it from a grid with optional clamps. The big yellow knob on the back of the unit controls both the color temperature selection and the dimming of the unit. It features an indent for fingertip control and is positioned at the edge of the fixture, which is cut away allowing you to adjust the knob from the side of the unit when the back is difficult to access. When you power on the light the yellow dimming knob defaults to controlling the dimming, pressing in the knob switches it to color temperature control (3200 to 5600K), pressing it again reverts back to dimming. You can also use the included wireless remote to control the color temperature and dimming. The light output stays consistent as you transition across the color temperature range, preventing the brightness spike that happens with many LED lights around 4300K. While some users may enjoy the small increase in light output that intensifiers bring, other users prefer to use barndoors without intensifiers. The removable intensifiers that come with this light attach securely to the barndoors. You do not have to attach all four intensifiers, which allows you choose how many barndoors to use for intensifying your output and how many barndoors to use to cut spill. The top and bottom barndoors integrate gel clips for attaching diffusion or gels. The fixture features an interchangeable Gold Mount battery plate. Removing four screws and disconnecting the snap connector allows you to swap out the included V-mount plate. On the back of the fixture is an LCD info screen that displays the battery power remaining, brightness percentage and color temperature. The ikan Heavy Duty Light Stand is a 7.6' aluminum stand which supports up to 14 lb. It has a 5/8" top stud and folds down to 37.7 inches. Box Dimensions (LxWxH) 21.0 x 18.2 x 5.1"
Box Dimensions (LxWxH) 40.0 x 4.4 x 3.9"